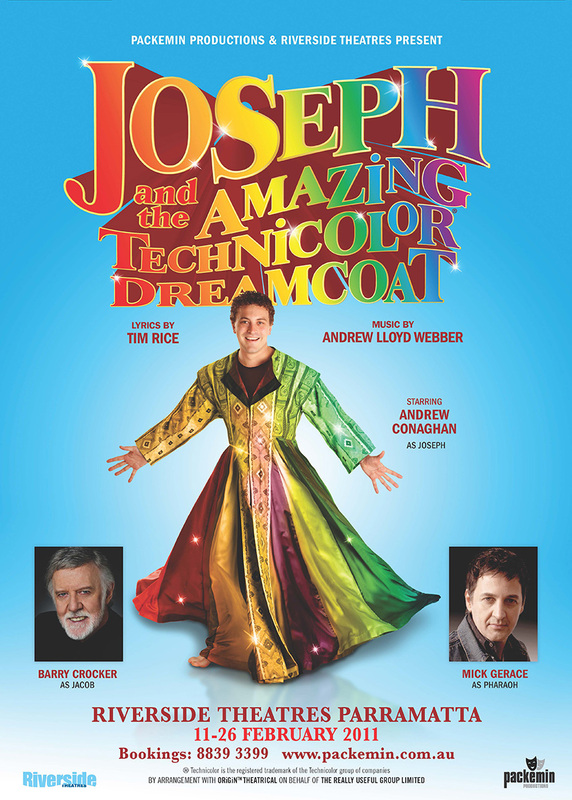 The company burst onto the stage in February 2011 with a spectacular new production of JOSEPH AND THE AMAZING TECHNICOLOR DREAMCOAT at the Riverside Theatre. The show starred Andrew Conaghan (Guys & Dolls, Titanic, The Music Of Andrew Lloyd Webber) as Joseph, Australian Entertainment Legend Barry Crocker as Jacob, and one of Australia's premier Elvis interpreters Mick Gerace as Pharaoh. This was followed in February 2012 by the hugely popular production of OLIVER! starring Wayne Scott Kermond (Singin' In The Rain, Guys & Dolls) as Fagin, Todd Keys (The Phantom Of The Opera, Dr Zhivago) as Bill Sikes and Katie McKee (My Fair Lady, Floyd Collins) as Nancy. Packemin Productions are thrilled to present a new version of the world's first rock musical, JESUS CHRIST SUPERSTAR. It is a retelling of the final seven days of the life of Jesus Christ as observed through the eyes of the apostle Judas. Propelled by a stirring score, by turns driving and majestic, satirical and tender, JESUS CHRIST SUPERSTAR illuminates the transcendent power of the human spirit with a passion that goes straight to the heart. Based on the novel and the hit-movie of the same name, LEGALLY BLONDE The Musical chronicles the journey of the famously perky Elle Woods, a fashion savvy, UCLA sorority girl who appears to have it all. But when her boyfriend Warner dumps her for someone 'serious', Elle uses her charm to getting into Harvard Law School in an attempt to win him back. With some help from new-found friends Paulette, Emmett and her chihuahua Bruiser, she learns that it's so much better to be smart. Starring JAY LAGA'AIA (Play School, Star Wars, The Lion King) as Shrek and LUKE JOSLIN (Les Miserables, Avenue Q, The Play That Goes Wrong) as Lord Farquaad. Following their hit productions of Joseph And The Amazing Tecnicolor Dreamcoat and Back To The 80's, Packemin Youth Productions returns to the Concourse in a massive new production of one of the worlds's favourite musicals....CATS! Composed by Andrew Lloyd Webber, and based on Old Possum's Book of Practical Cats by T. S. Eliot. The musical tells the story of a tribe of cats called the Jellicles and the night they make what is known as "The Jellicle Choice" and decide which cat will ascend to the Heavyside Layer and come back to a new life. It features the iconic musical theatre song "Memory". Packemin Productions and Riverside Theatres will be defying gravity in their upcoming production of Wicked in July/August 2016. Wicked tells the incredible untold story of the witches of Oz. Long before Dorothy dropped in, two other girls meet in the land of Oz and formed an unlikely but profound friendship: the blonde and very popular Glinda and a misunderstood green girl named Elphaba. Their extraordinary adventures in Oz will test their friendship to the limit and ultimately see them fulfil their destinies as Glinda The Good and the Wicked Witch of the West. Awe-inspiring and spectacular, this gravity-defying show has been playing on Broadway since 2003 and recently completed a seven year continuous run throughout Australasia. 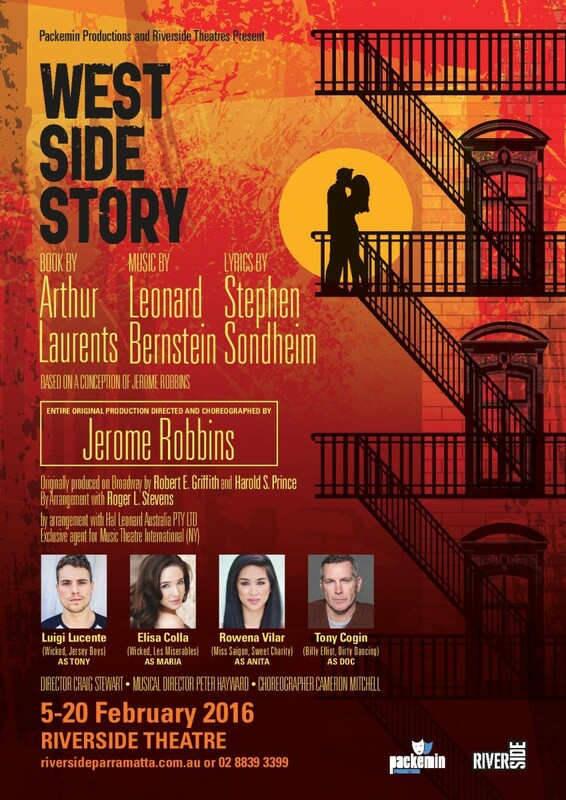 Following the sell-out success of our latest sell-out show, Mary Poppins, Packemin Productions will bring you the world's greatest love story, WEST SIDE STORY. Be swept up in the story of Tony, Maria, The Sharks and The Jets in this Iconic multi-award winning Broadway musical that is one of the theatre's finest accomplishments. Following the success of their inaugural sell-out production, Joseph and the Amazing Technicolor Dreamcoat, Packemin Youth Productions returns in 2016 with the totally awesome musical BACK TO THE 80's. Featuring over 60 of Sydney's most talented young performers and special guest star Mark Simpson (Hairspray, The Rocky Horror Show) as Mr Cocker. 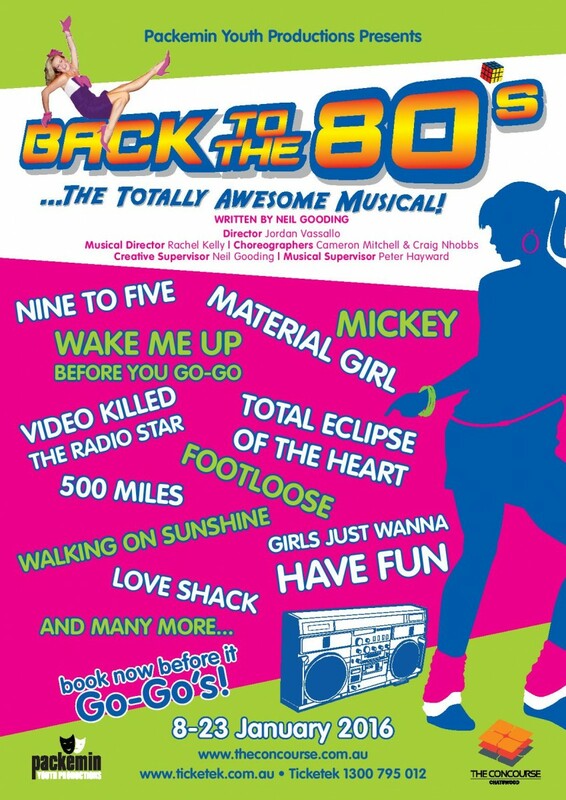 This awesome musical will include all your favourite hits from the 80's including Girls Just Wanna Have Fun, Man In the Mirror, 500 Miles, Kids In America, Footloose and more! Brilliantly adapted from the beloved books by Australia's own P.L.Travers and the classic 1964 Walt Disney film, Packemin Productions invites you to let your imagination take flight as you step into the magical world of Disney and Cameron Mackintosh's Mary Poppins. With some of the most unforgettable songs of all time including Supercalifragilisticexpialidocious, Feed the Birds, A Spoonful of Sugar and Chim Chim Che-ree, Mary Poppins is a musical that will charm the whole family. The inaugural PACKEMIN YOUTH PRODUCTIONS show was the family classic JOSEPH AND THE AMAZING TECHNICOLOR DREAMCOAT, and played at The Concourse in Chatswood in January 2015. BEAUTY AND THE BEAST starred Scott Irwin (Les Miserables, Beauty And The Beast) as The Beast, Donna Lee (Les Miserables, High School Musical) as Mrs Potts and Adam Scicluna (Mo Award Winner, The Wizard Of Oz) as Cogsworth. Starring the sensational Amanda Muggleton (Prisoner, Hello Dolly, Shirley Valentine) as Miss Hannigan, musical theatre star Rodney Dobson (Wicked, Miss Saigon, The Full Monty) as the charismatic and sophisticated New York 'zillionaire' Oliver 'Daddy' Warbucks, song and dance man, Christopher Horsey (Hot Shoe Shuffle, Bootmen, Singin' in The Rain) as the charismatic conman Rooster and boasting a classic Broadway score with hit song after hit song including Tomorrow, It's The Hard Knock Life, Maybe and Little Girls, ANNIE is a spectacular production that will delight audiences of all ages. HAIRSPRAY starred Australian entertainment legend JON ENGLISH in the role of Edna Turnblad, Helpmann Award nominee WAYNE SCOTT KERMOND (Singin’ In The Rain, Hot Shoe Shuffle) in the role of Wilbur Turnblad following his starring role as Fagin in Oliver!, CLE MORGAN (Hairspray, Australian Idol) as Maybelle and introducing talented newcomer JESSICA ROOKEWARD as the loveable Tracy Turnblad. Our February 2013 production was the iconic THE WIZARD OF OZ starring Jimmy Rees (Jimmy Giggle on ABC’s Giggle & Hoot) as The Scarecrow, Laura Murphy (Sparkles The Fairy on Channel 9's Magical Tales) as Dorothy, Helpmann Award winning musical theatre performer Luke Joslin (Avenue Q, Annie, Dr Zhivago) as The Tinman, and multi-Mo Award winner Adam Scicluna as The Lion. With a crash of drums and a flash of light, Packemin Productions and the Riverside Theatres staged a spectacular new production of Joseph and the Amazing Technicolor Dreamcoat in February 2011. Starring Andrew Conaghan (Guys & Dolls, Titanic, The Music Of Andrew Lloyd Webber) as Joseph, Australian Entertainment Legend Barry Crocker as Jacob, one of Australia's premier Elvis interpreters Mick Gerace as Pharaoh and a massive cast of talented performers and local school choirs, the production was an incredible launch for Packemin Productions.